I have been inflicted with pregnancy brain. Me, who has an awesome memory, a wicked eye for spotting things and a notorious planner. The following tale is a true story. 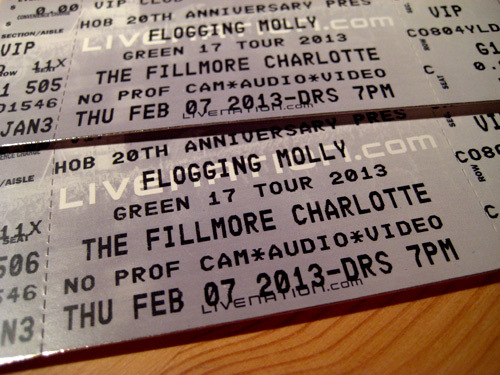 Rob and I scored some tickets to the Flogging Molly concert. Not a lot of fun bands come to Charlotte and we haven't been to a concert in 5 years. This was something I really wanted to do. I love Flogging Molly! I actually had to convince Rob that we should go despite me being 7 months pregnant. We had the day all planned out. Rob worked from home that day, so the dogs wouldn't be in their crates all day and he'd be able to walk them. I'd pick up Rob after work and we'd have dinner at the pub next to the Fillmore. I dressed up in something cute. I was so excited! How fun would it be to tell our kid that it was at a concert? So 3 o'clock rolls around, almost time to go home. I go on Facebook to check out what specials the pub is having that night. Latest post, beers on tap. Next post, "Pregame for Flogging Molly Specials". Sweet, irish car bombs, I'll have to tell Rob. (of course none of that for me). Then I saw it...the pregame specials was posted 22 hours ago. Why are they posting a special so early?! A wave of panic hit me. I checked the Fillmore's site. I don't see Flogging Molly up there anymore, maybe because it's tonight? Too scared to look further I messaged Rob. Me: Please check what day the concert is. I'm being paranoid. Me: Please please please tell me I did not just f this up!! Rob: OMG!! It was yesterday!!! That's right. We missed the concert. My pregnant brain had it set that the concert was Friday and not Thursday!!! How did I miss this?! I had known about the concert for months. We had the tickets in our hand. I went on Fillmore's and Flogging Molly's website. I even saw what time the doors opened and what time the concert started. Yet I NEVER bothered checking the date! If I wasn't at work I would've completely lost it and cried my little heart out. I was so bummed, so embarrassed. I took it hard. Thankfully, Rob being such an awesome husband told me that it was OK, to put it behind me. I did laugh about it, because if I didn't I'd be a wreck. Humility folks, it comes in handy. And now I have a funny story. A story to tell our friends and family and even our kid about the time Suzy had major pregnant brain and missed a concert.